Click on images for full a description. Australian War Memorial ID 052384 Photo by James Tait; TATURA, VIC. 1943-06-10. PORTION OF THE SLEEPING QUARTERS AT NO. 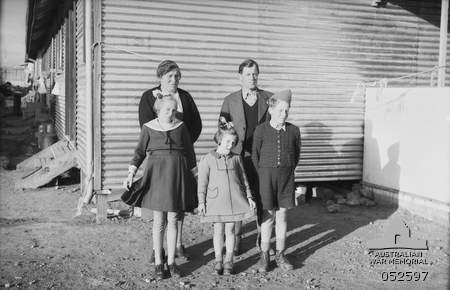 1 CAMP, TATURA INTERNMENT GROUP (GERMAN). THESE HUTS ARE BUILT TO ACCOMMODATE TWENTY FOUR PERSONS, BUT THE NUMBER VARIES BETWEEN FOURTEEN AND NINETEEN. Australian War Memorial ID 052460 Photo by James Tait; TATURA, VIC. 1943-06-15. JAPANESE INTERNEES OF NO. 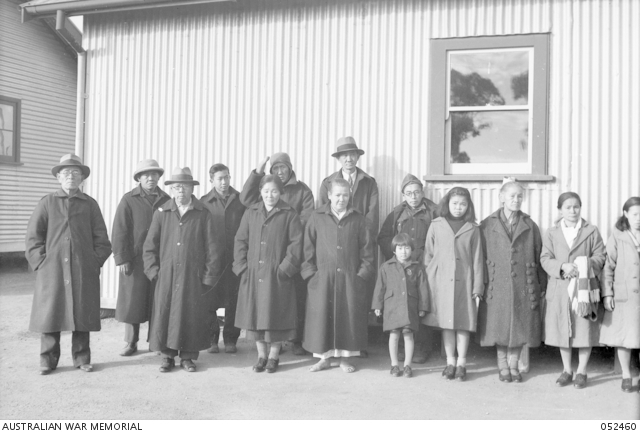 4 CAMP, TATURA INTERNMENT GROUP, LINE UP FOR DENTAL PARADE, AT NO. 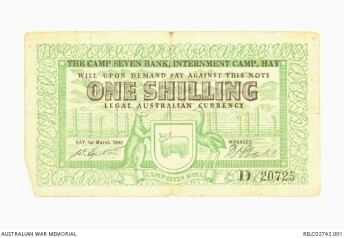 1 CAMP, TATURA INTERNMENT GROUP. LEFT TO RIGHT:- IJ51698 KURIMOTO; IJ50484 KWIK TIAUW TLIEN;UIJ50439 ANG TOO LAM; IJ50365 SIA TING TJIOE; IJF50651 SATA MASUNO; IJ50504 SAI YO; IJF51803 OSHIRO YOSHI; IJ50298 TAN SWIE PAN; CJF19038 GOTO KIMIKO; CJ18731 MURAYAMA SHIMPEI; LIF50471 SHU GIOK HOEN; QJF16237 YUKAWA CHIE; IJF50455 SAI KAKU SI CHIN KAN; IJF50537 ONG TJOEN HWA. Australian War Memorial ID 030150/08 Photo by Lewecki; Cowra, NSW. 16 September 1943. 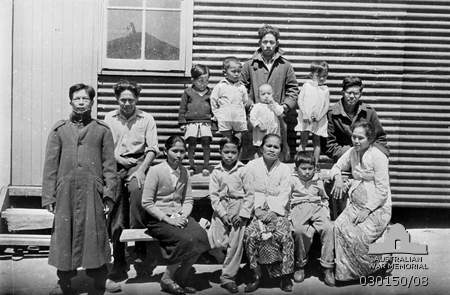 Group of Indonesian internees and their children, interned at No. 12 PW & I (prisoners of war & internee) Group. Australian War Memorial ID 123004 Photo by Hedley Keith Cullen; Barmera, South Australia. 1945-12. 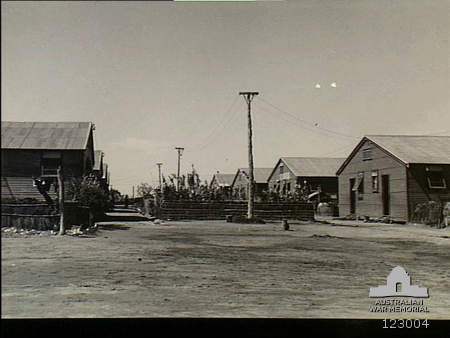 Typical huts in 14C Compound of No 14 Camp in the Loveday Internment Camp Group. 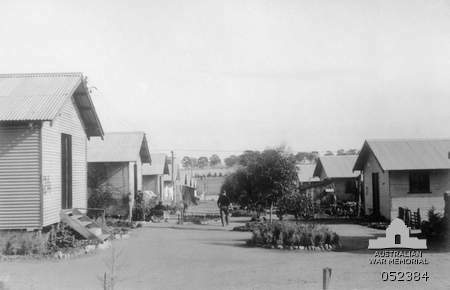 The gardens between the huts were made by Japanese internees. Australian War Memorial ID 123032 Photo by Hedley Keith Cullen; Renmark, South Australia. 1943-05-13. 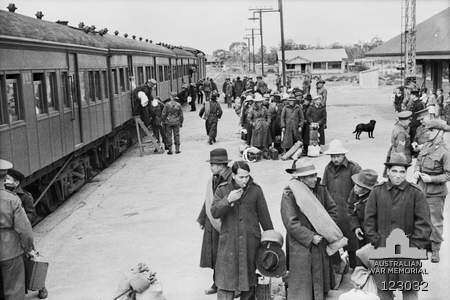 Japanese internees starting to leave the train which brought them from Hay on their way to the Loveday Internment Camp Group in the Barmera area. Australian War Memorial ID 122983 Photo by Hedley Keith Cullen; Barmera, South Australia. 1945-12. 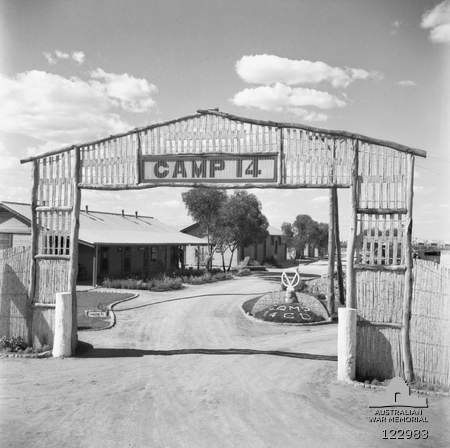 The entrance to No 14 Camp of the Loveday Internment Camp Group. The bamboo and wood arch was built by Japanese internees. Australian War Memorial ID 064810 Photographer Unknown; BARMERA, SOUTH AUSTRALIA. 1943-03-11/17. 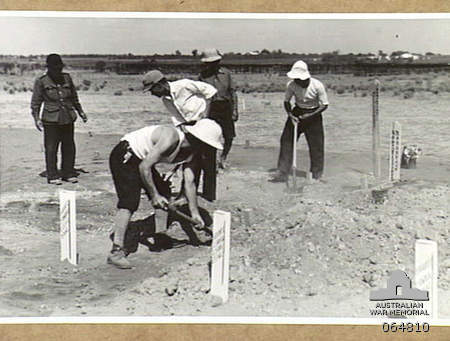 JAPANESE PRISONERS OF WAR DIGGING A GRAVE FOR ONE OF THEIR FELLOW PRISONERS OF WAR WHO DIED AT THE 14TH AUSTRALIAN PRISONER OF WAR CAMP LOVEDAY GROUP. Australian War Memorial ID 123079 Photo by Hedley Keith Cullen; BARMERA, SA 1944-04. NO. 9 CAMP NURSERY, LOVEDAY INTERNMENT GROUP. 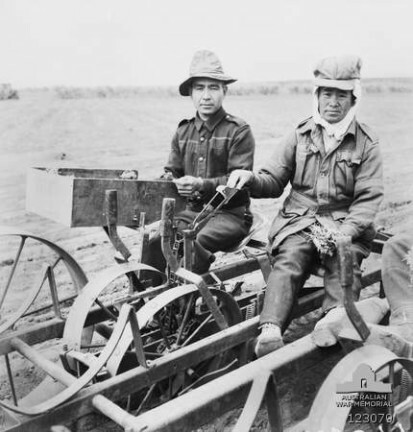 TWO JAPANESE INTERNEES ON A “HOLLAND” CELERY PLANTER BEING TOWED BY TRACTOR. THEY ARE PLANTING GUAYULE SEEDLINGS THEY HAD RAISED FOR TRIALS TO INVESTIGATE THE PLANT’S USE AS AN ALTERNATIVE SOURCE OF NATURAL RUBBER. THE AMERICAN MADE MACHINE GAVE A GOOD MEASURE OF SUCCESS IF THE OPERATORS WORKED IN PAIRS. ONE SELECTED THE SEEDLINGS FROM A BOX AND HANDED IT TO HIS PARTNER WHO PLACED THEM BETWEEN RUBBER GUIDING “FINGERS”. THESE CONVEYED THEM IN AN UPRIGHT POSITION TO THE FURROW WHERE THEY WHERE RELEASED AND PRESSED IN FIRMLY BY TWO WHEELS SET ON AN ANGLE. Australian War Memorial ID 123154 Photo by Hedley Keith Cullen; BARMERA, SA 1944-11. NO. 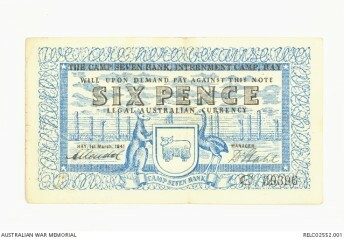 9 GARDENS, LOVEDAY INTERNMENT GROUP. PYRETHRUM CROPS WERE PLANTED IN 1943-01 AND 1943-02 AFTER SUPPLIES OF PYRETHRIN (AN IMPORTANT INSECTICIDE) FROM KENYA BECAME UNCERTAIN. THESE INITIAL ATTEMPTS USING SEED FROM KENYA FAILED BUT CROPS PLANTED IN 1943-03 WERE SUCCESSFUL DESPITE PROBLEMS CAUSED BY DROUGHT AND SAND DRIFTS. 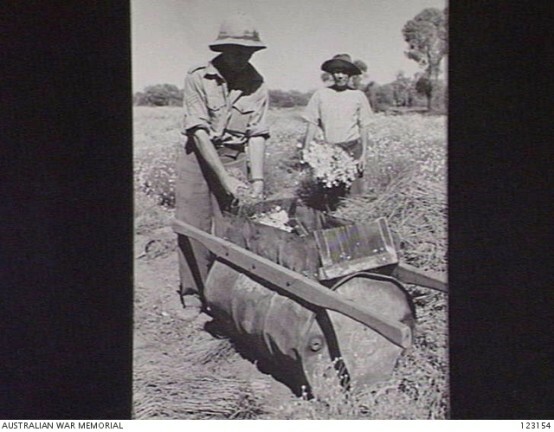 THE FIRST CONSIGNMENT OF FLOWERS WAS SENT FOR PROCESSING IN 1944-06 WITH FURTHER BALES SENT REGULARLY THEREAFTER. S1401 SERGEANT H. B. WESCOMBE, A PROJECT SUPERVISOR, REMOVING FLOWER HEADS AS A JAPANESE INTERNEE APPROACHES WITH MORE BLOOMS. Australian War Memorial ID 052597 Photo by James Tait; TATURA, VIC. 1943-06-24. INTERNED ITALIAN FAMILY AT NO. 3 CAMP, TATURA INTERNMENT GROUP. LEFT TO RIGHT:- MRS BERTA RIBONI; ERASMO RIBONI; FRONT:- ELEONORA, FEDERICA, AND PAOLO. Australian War Memorial ID 030188/06 Photo by Colin Thomas Halmarick ; Tatura, Australia. 13 February 1943. Group of Italian internees from overseas now interned at Tatura Internment Camp. 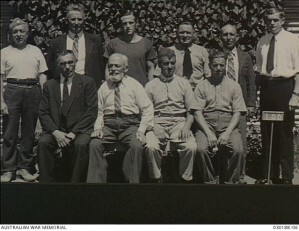 Back row, left to right: S. Ferrarin; A. Alonzi; G. Baldelli; E. Galante; G. Felloni; Mertes. Front row: G. Crolla; G. Pelosi; G. Mocogni; P. Mocogni. Australian War Memorial ID 030151/01Photo by Lewecki; Cowra, NSW. 16 September 1943. 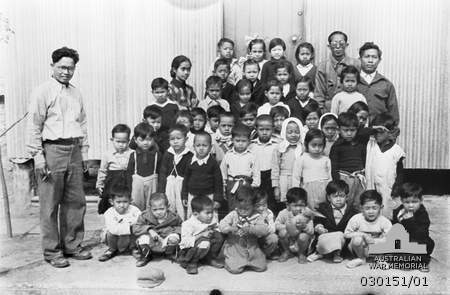 Group of young children of Indonesian internees interned with their parents at No. 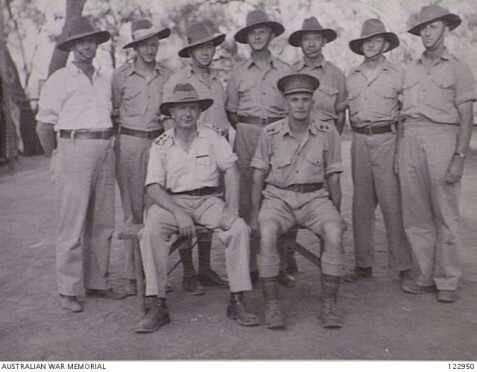 12 PW & I (prisoners of war & internee) Group, photographed with their Indonesian teachers. 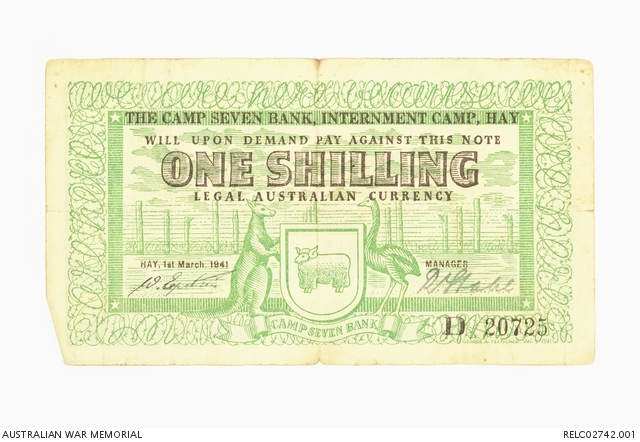 Australian War Memorial ID RELC02552.001 This note was produced for use by prisoners within the confines of Internment Camp 7 at Hay, New South Wales. 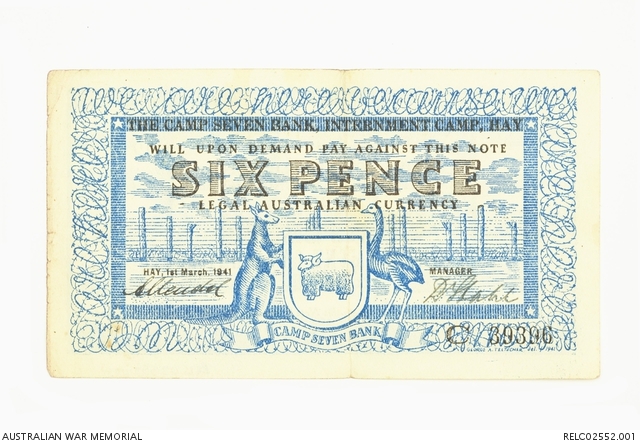 The note was designed by internee George Teltscher and printed by Harry Byers in the printshop of the Riverine Grazier, Hay. 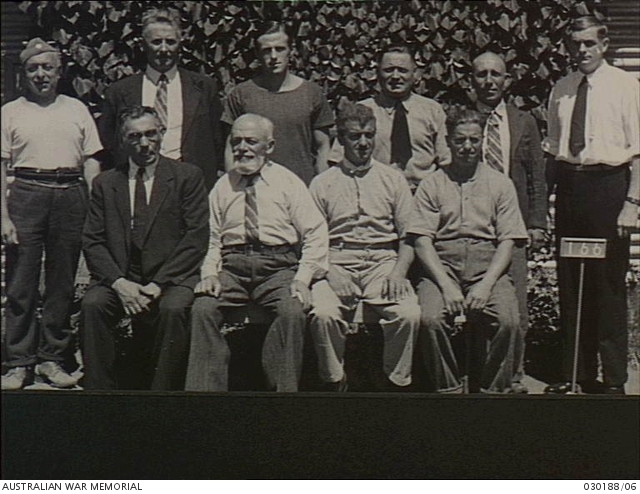 Australian War Memorial ID 030246/14 Photo by Ronald Leslie Stewart ; Tatura, Australia. 10 March 1945. 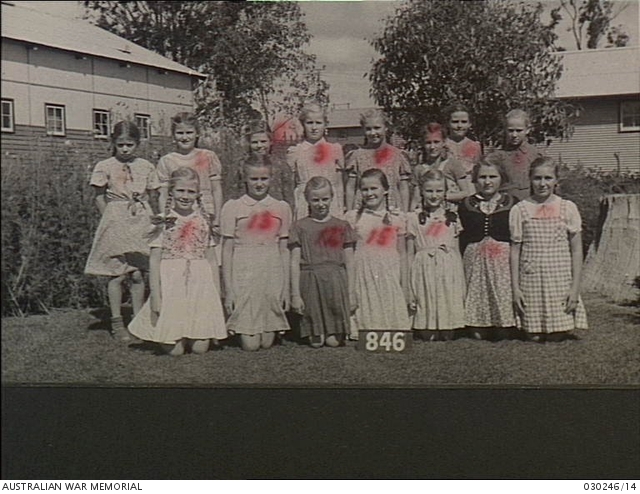 A class of German school children whose parents are interned at No. 3 Camp, Tatura Internment Group, photographed outside the school building in the Camp. Shown here are pupils in Class III: Gabriele Drude; Elselore Ortel; Nelly Dreher; Hannelore Dyck; Irene Wied; Hilde Bergmann; Ruth Linsenmeier; Anne Scheerle; Heidi Schnerring; Luise Kubler; Helga Palmer; Gretel Weiss; Friedrike Fuchs; Rosemarie Weigold; Inge Steller.